Update: On 26 October 2017, ADHRB received reports that Bahraini authorities transferred Nabeel Rajab from the Ministry of Interior (MOI) police clinic, Al-Qala’a, to Jau Prison, the kingdom’s main long-stay male detention center. The prison administration appears to be holding him away from other political prisoners and the guards have subjected him to degrading treatment, including forcibly shaving his hair, arbitrarily raiding his cell at night, and confiscating his personal items. A Bahraini court has postponed yet another hearing for imprisoned human rights defender Nabeel Rajab today, 25 October 2017. President of the Bahrain Center for Human Rights (BCHR), Rajab has been arbitrarily detained since 13 June 2016 on charges related solely to free expression. On 10 July 2017, he was sentenced to a two-year prison term in one case stemming from media interviews in which he discussed the kingdom’s restrictions on free press. Today’s postponement was a hearing for his appeal of this conviction, which is now set to reconvene for final arguments on 8 November. In addition to this two-year team, Rajab faces another 15 years in a separate trial for comments made on social media in which he criticized the war in Yemen and systematic torture in Bahrain. The government has pushed his next hearing for this case to 19 November. Furthermore, the authorities have also threatened to prosecute Rajab over editorials that have been published in the New York Times and Le Monde during his detention. Rajab has spent much of his detention in solitary confinement and unhygienic conditions that have led to a drastic deterioration of his health and repeated hospitalizations. American officials have consistently called on the Bahraini government to release Rajab since both his arrest and recent conviction. “The sentencing of Mr. Rajab demonstrates a serious step backwards, and undermines my confidence in the Bahraini government’s commitment to reform,” said Senator Ben Cardin (D-MD), Ranking Member of the Senate Foreign Relations Committee (SFRC). 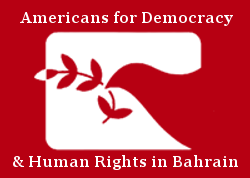 The Bahraini authorities have shown a “troubling lack of commitment…to the rule of law, due process, human rights, and protection of universal freedoms.” Senator Marco Rubio (R-FL), another member of the SFRC, called the July sentence “outrageous,” and the State Department indicated that the administration is “disappointed by the verdict” and reiterated its previous calls for Rajab’s release. Despite these clear concerns, the US government has increasingly sent mixed messages to Bahrain, with the State Department recently approving an unconditional $3.8 billion arms sale to Bahrain. Though Congress can still decide to impose holds on the deal, it appears to currently be proceeding with informal pre-approval from SFRC leadership. The Trump administration dropped Obama-era restrictions on a portion of the sale that were intended to incentivize human rights reforms. Nabeel Rajab is held solely for his human rights work, and the Government of Bahrain must immediately release and drop all charges against him. Bahraini authorities should also allow Rajab to travel internationally and seek necessary medical attention. The US and the rest of international community must be unequivocal in their calls for this outcome, and must push the Bahraini government to release all prisoners of conscience detained for exercising their basic human rights.